Located in the historical centre of town, this Parador is an old Renaissance palace dating from the 16th century which was formerly the residence of the Counts of Maceda. Distinguished, stately and noble describe the interior which boasts regal staircases, antiques and illustrious furniture. The carved stone staircase leads the way to the welcoming, comfortable bedrooms. The dining room has an aristocratic appearance completing the harmony of the common areas decorated with mirrors, paintings and candelabras. As is usual in the paradors, the menu concentrates on the regional cooking. There are however international dishes and a special gluten free suggestions. The main menu is varied giving guests the chance to taste the various meats, fishes and shellfishes of the region. Everything may be accompanied by the excellent local Albarino, Ribeiro or Mencia wines. Visit the Basilica of Santa Maria la Mayor, the Church of Peregrina, the Convent of San Francisco and the museum. Nearby is Vigo, a big and thriving city located by a beautiful ria (valley that is submerged under the sea). In Parador of Pontevedra the most important festivals are the pilgrimage of San Benitino de Lerez, Feast of Santiaguino del Burgo, Peregrina Festival (August) which often includes bull fighting and the Carnival on Shrove Tuesday. The beaches of Bueu, A Lanzada and Sanxenxo preserve all their natural beauty. Here you may go swimming, sailing, and surfing and other beach sports. Other activities near the Parador are: golf, horse riding, cross country driving, visiting the aquarium or going for a dive inside the tourist submarine in the village of O Grove. 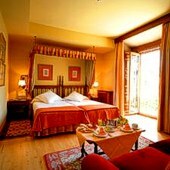 Parador Pontevedra has thirty twin bedded rooms, eleven double bedded rooms, three single rooms, two Suites and one quadruple room. 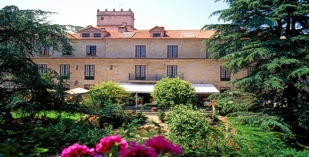 The Pontevedra Parador also has central heating, air conditioning, currency exchange, lift, parking facilities (without security and limited places), satellite television, gift shop, restaurant, bar and conference facilities if required. Distance from the nearest airport is approximately 28 kms, train station is 2 kms away and the nearest port is 6 kms away. Eu e minha esposa estavamos fazendo a Rota Portuguesa do Caminho de Santiago. Os pernoites eram feitos em albergues e hostais, mas eu fiz uma surpresa para ela, que é espanhola, reservando aquela noite no Parador Pontevedra. As instalações e a localização do Parador são ótimas. Tivemos um problema com o almoço, falei com a garçonete e com o "maitre", mas não concordei com as justificativas apresentadas. Ao fazer o check-in percebi que o valor total do prato estava lançado. Comentei com o senhor da recepção, que imediatamente retirou o valor da conta. Pelo que agradeço. Não pelo dinheiro, mas por reparar o desgosto de quem tinha acabado de andar 25km com mochila nas costas e ficar sem comer direito.Mas voltarei a me hospedar num Parador. Pontevedra was the first parador we have stayed at. It was really difficult to locate the hotel - we had expected it to be well signed - it isn't. We eventually saw one sign but then no more until very close to the building. The building is lovely with beautiful old staircase - shame it is not for general use as the first floor has meeting/reception room, not bedrooms. Our room was OK, not very large but view out over the garden. It had a sofa bed in it which was very uncomfortable to sit on and if it had been pulled out as a bed there would have been no floor space left, in fact there wasn't room for it to be pulled out. The staff were very pleasant and helpful, especially with the car parking in the small courtyard. The breakfast was very disappointing, except for the lovely fresh orange juice. The hot food was not hot and not very inspiring. We enjoyed walking round the old town. 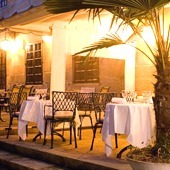 We enjoyed very much our stay at the wonderful palace of Pontevedra and taking dinner on the terrace in the garden in the evening. Only the night was extremely noisy till the morning hours. At the reception they said that groups of young people celebrated a weekend party in the open air, what occurs more and more often. 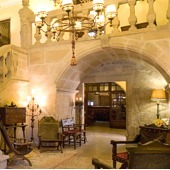 Parador de Pontevedra is in a sixteenth century palace in the historical area of Pontevedra, now converted into a hotel.